Gastrointestinal carcinoid, also called carcinoid tumor, is the most common primary tumor of the small bowel and appendix. Gastrointestinal carcinoid accounts for more than 95% of all carcinoids. The tumors arise from enterochromaffin cells of Kulchitsky, which are considered neural crest cells situated at the base of the crypts of Lieberkühn. Gastrointestinal carcinoids account for 1.5% of all gastrointestinal tumors. The tumors elaborate serotonin and other histaminelike substances that normally are transported to the liver, where they are metabolized. Characteristics of gastrointestinal cancer are shown in the images below. Characteristic appearance of small-bowel carcinoid. Plain abdominal radiograph in a 55-year-old man presenting with clinical features of bowel obstruction. Small-bowel dilatation is confined to the upper abdomen. Speckled calcification is noted in a small, circular mass to the right of the mid lumbar spine. Characteristic appearance of mesenteric desmoplastic reaction from a carcinoid. A 10-mm lower CT section shows stellate radiating and beaded mesenteric neurovascular bundles of the mesentery (arrows) associated with kinking (K) of the small bowel. Characteristic appearance of carcinoid liver metastases with different imaging modalities. 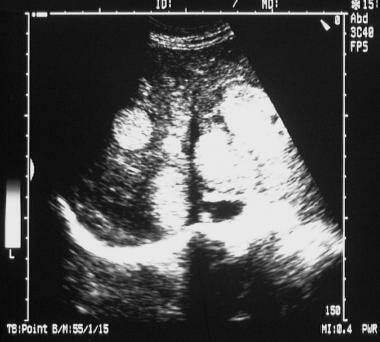 Axial sonogram through the liver shows multiple fairly well-defined echogenic liver metastases of varying sizes (see the next image for a left-sided image). Characteristic appearance of carcinoid liver metastases with different imaging modalities. Axial sonogram through the liver shows multiple fairly well-defined echogenic liver metastases of varying sizes (see the previous image for a left-sided image). Appearance of pancreatic carcinoid. Right hepatic angiogram shows early enhancement of multiple liver tumors. Most tumors are clinically silent, but they may cause pain or intestinal obstruction, weight loss, a palpable mass, or, rarely, bowel perforation. Carcinoid syndrome occurs when the humoral load exceeds the capacity of monoamine oxidase (MAO) present in the liver and lung to metabolize serotonin. Most patients with carcinoid syndrome have liver metastases from a bowel carcinoid, although in rare cases, the humoral load from a primary tumor may overwhelm the liver and the capacity of the lungs to metabolize serotonin. Rarer still is carcinoid syndrome that develops in patients with noncarcinoid malignant tumors and dermatomyositis. Diagnosis is usually achieved by using several complementary imaging techniques. 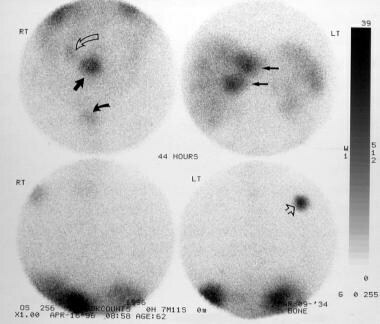 The most promising imaging technique is somatostatin receptor scintigraphy. [2, 3, 4] The technique can aid diagnosis by localizing primary and metastatic sites of gastro-enteropancreatic endocrine tumors. The degree of radionuclide uptake is related to somatostatin receptor density. In gastrointestinal carcinoids, the concentration at the receptor sites is high (90%). Plain radiographic findings (eg, soft-tissue mass, punctate calcification within a mass, signs of intestinal obstruction) are not specific for carcinoids. Plain radiographs are usually obtained in an acute setting, being taken, for example, in patients presenting with intestinal obstruction or perforation. Results of barium studies are nonspecific, and these tests are usually performed in patients presenting with nonspecific gastrointestinal symptoms. Clinical correlation is required. Ultrasonography is performed to investigate a variety of abdominal complaints. The radiologist must be aware of the ultrasonographic appearances of a carcinoid. Although these are nonspecific, they may lead to the most appropriate investigation and result in a diagnosis. Computed tomography (CT) scan findings in a malignant carcinoid depend on its size, degree of mesenteric invasion and desmoplastic reaction, and the presence of regional lymph node invasion. In the appropriate setting, the appearance of a malignant carcinoid on a CT scan may be highly suggestive of a diagnosis of carcinoid. Angiography is essential in interventional procedures involving liver metastases. Somatostatin receptor scintigraphy and endoscopic ultrasonography have a direct clinical impact, because they influence individual therapeutic strategies. None of the radiologic techniques can provide a specific diagnosis; therefore, clinical input is obviously important. 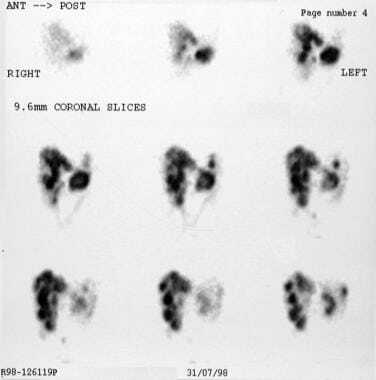 All of the imaging techniques listed above provide anatomic information, with the exception of radionuclide studies. A carcinoid is a functioning tumor, which means that clinical correlation is important. Indications for performing various imaging studies are dependent on the initial presentation. Two techniques stand out: CT scanning is better at providing anatomic information than are barium studies, and radionuclide studies add a functional element, which is obviously important in the context of carcinoid syndrome. 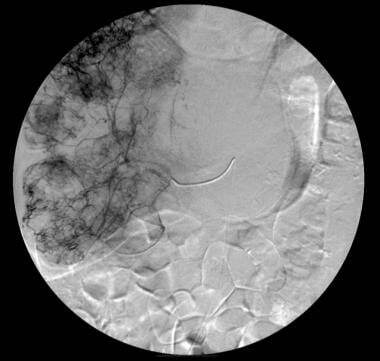 Cholangiography shows a polypoid filling defect within the biliary tree or an infiltrating form in which duct stenosis is demonstrated. On barium examination, radiologic features are similar to those of adenocarcinoma and include a filling defect within the colon caused by a sessile polyp, circumferential narrowing (apple-core lesion) associated with mucosal destruction, loss of mucosal folds, and ulceration. Imaging findings in a malignant carcinoid depend on its size, the degree of mesenteric invasion/desmoplastic reaction, and the presence of regional lymph node invasion. Bowel loops in the right iliac fossa separate and external compression, asymmetric spiculated contour, and kinking of adjacent bowel are demonstrated. The carcinoid tumor may not be visible because it is usually buried in the adjacent mass. A large-bowel barium series may show compression or infiltration of the cecum at the base of the appendix. On barium series, duodenal carcinoid tumors appear as intraluminal polypoid lesions or infiltrating lesions that cause an irregular stricture. Imaging findings are nonspecific and depend on the type of tumor. On barium meal examination, the most common finding is a single, intramural, sharply demarcated defect that is usually 2-3 cm in diameter. Tumors may be located anywhere in the stomach, although a fundal location is said to be rare. Features may mimic leiomyoma/leiomyosarcoma. Tumors may be ulcerated. Less commonly, tumors may appear as a large ulcer or polypoid mass. In type I disease, multiple sessile polypoid lesions of varying sizes may be seen arising from the wall of the stomach. Atypical carcinoids may occur in which histology demonstrates a combination of carcinoid and adenocarcinoma. Atypical tumors have a tendency to ulcerate and show more aggressive behavior, with local tumor spread and lymph node metastasis. The prognosis in patients with atypical tumors usually is poor. A bull's-eye, or target, lesion may be seen. This appears as an ulcer on the apex of a nodule on barium meal examination. When a target lesion is noted, the differential diagnosis includes gastric metastases (melanoma, lymphoma, carcinoma-breast, bronchus, pancreas), leiomyoma, pancreatic rest, and gastric neurofibroma. Tumors may present as intraluminal, extramucosal filling defects on barium studies. Tumors are indistinguishable from the more common adenomatous polyps on barium enema. Polyps may be ulcerated. Endorectal ultrasonography and endorectal magnetic resonance imaging (MRI) better demonstrate perirectal infiltration. Plain abdominal radiographs may reveal curvilinear calcification within the abdomen. These are usually smaller than 15 mm in diameter and result from calcification within the tumor. On barium studies, findings consist of fairly well-defined, round, intraluminal bowel-filling defects. 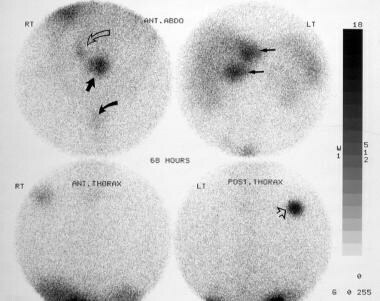 These may be associated with thickening of the valvulae conniventes resulting from interference of the bowel blood supply by the tumor. With invasion of the mesentery, the mesenteric mass causes rigidity, displacement/stretching, and fixation of small-bowel loops. 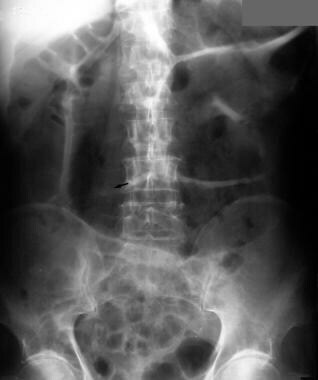 Desmoplastic reaction from mesenteric invasion causes sharp angulation of a bowel loop or a stellate or spokelike wheel arrangement of adjacent bowel loops. The tumor often infiltrates the mesentery, provoking an intense fibrotic reaction that results in kinking of the bowel segments; such kinking may in turn cause intestinal obstruction. On a small-bowel barium series, kinking of the small-bowel loops is considered the hallmark of a small-bowel carcinoid tumor. See the images of small-bowel carcinoid below. Characteristic appearance of small bowel carcinoid. 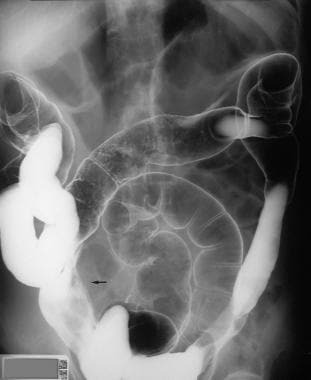 Barium enema in a 55-year-old man presenting with clinical features of bowel obstruction (same patient as in the previous image). Barium enema study shows no obstructive lesion within the large bowel, but the cecum demonstrates an extrinsic impression on its medial side (arrow). 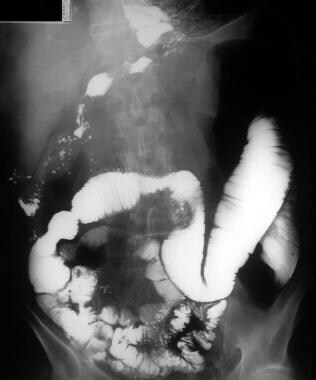 Characteristic appearance of small bowel carcinoid in a 55-year-old man presenting with clinical features of bowel obstruction (same patient as in the previous 2 images). Upper gastrointestinal barium series shows a smooth submucosal mass in the mid jejunum eccentrically placed and associated with thickened valvulae conniventes resulting from bowel edema and proximal small-bowel dilatation. Note the angulation of the bowel and kinking of the jejunum at the site of the submucosal mass. Plain radiographic findings in gastrointestinal carcinoid are nonspecific and may simply reflect bowel obstruction. The calcification occasionally seen in a pancreatic or bowel carcinoid is nonspecific and has many differential diagnoses; however, kinking of the small bowel on a barium series is considered the hallmark of a small-bowel carcinoid. Any cause of intestinal obstruction may mimic obstruction resulting from a carcinoid; moreover, on barium series, an intraluminal filling defect found at any location within the bowel, whether benign or malignant, may appear similar to a gastrointestinal carcinoid. CT scans may demonstrate intrahepatic biliary dilatation associated with an intraductal mass of varying attenuation in the common bile duct. A Klatskin-type tumor representing biliary carcinoid has been reported. The frequent presence of an extraluminal component can be delineated better on CT scans. Generally, CT scanning is used to stage colon tumors but not to detect them. CT scan findings of colon carcinoids appear similar to those of adenocarcinoma. The tumor may be visualized as a discrete mass or as focal wall thickening. CT scanning may demonstrate thickening of the stomach wall by nodular masses. A large polypoid mass has been reported arising from the lesser curve of the stomach, with areas of low density that were presumed to represent necrosis. Characteristic appearance of carcinoid liver metastases. Contrast-enhanced axial CT scan through the upper abdomen shows early arterial enhancement of the liver metastases (see the next image for the portal venous phase). Characteristic appearance of carcinoid liver metastases. 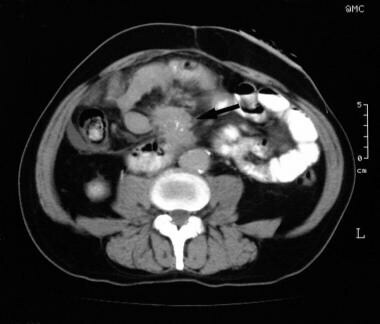 Contrast-enhanced axial CT scan through the upper abdomen shows portal venous phase. The metastases appear as negative defects against the normally enhancing liver (see the previous image for the hepatic arterial phase). CT scanning should be able to demonstrate extraluminal extension and metastases. Appearance of pancreatic carcinoid. 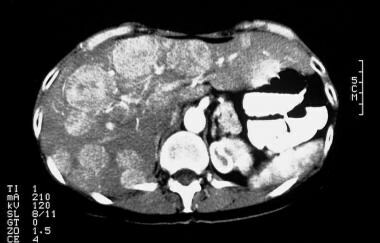 Nonenhanced CT scan through the upper abdomen shows a 9-cm mass in the region of the tail of the pancreas with intratumoral pancreatic calcification and multiple mass lesions within the liver, suggestive of metastases. Appearance of pancreatic carcinoid. Dynamic contrast-enhanced CT scan in the delayed portal venous phase shows enhancement of the pancreatic tail tumor (arrow) with central necrosis (same patient as in the previous image). Characteristic appearance of mesenteric desmoplastic reaction from a carcinoid. 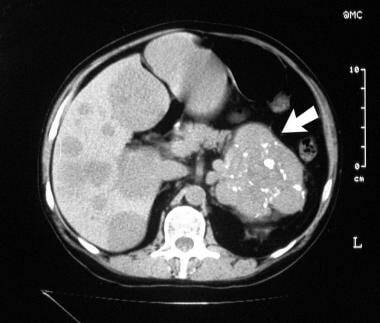 Axial CT scan through the mid abdomen shows a mesenteric mass (long arrow) with shaggy borders and probable intratumoral punctate calcification (short arrow). Liver and lymph node metastases from an intraluminal bowel mass with mesenteric invasion can mimic carcinoids. Generally, MRI is not used in the diagnosis of gastrointestinal carcinoids. Liver metastases are demonstrated well on MRIs and usually have low signal intensity on T1-weighted images and high signal intensity on T2-weighted images. After the administration of a gadolinium-based contrast agent, liver metastases enhance peripherally in the hepatic arterial phase and appear as hypointense defects against the enhancing normal liver in the portal venous phase (see the images below). Characteristic appearance of carcinoid liver metastases. Gadolinium-enhanced axial MRI through the liver shows early arterial enhancement of multiple liver tumors (see the next image for the portal venous phase). Characteristic appearance of carcinoid liver metastases. Gadolinium-enhanced axial MRI through the liver shows portal venous phase enhancement of multiple liver tumors (see the previous image for the hepatic arterial phase). MRI demonstrates biliary carcinoids as being hyperintense relative to the liver on T2-weighted images and hypo-intense relative to the liver on T1-weighted images. Gadolinium-based contrast agents gadopentetate dimeglumine, gadobenate dimeglumine, gadodiamide, gadoversetamide, and gadoteridol have been linked to the development of nephrogenic systemic fibrosis (NSF) or nephrogenic fibrosing dermopathy (NFD). For more information, see Nephrogenic Fibrosing Dermopathy. The disease has occurred in patients with moderate to end-stage renal disease after being given a gadolinium-based contrast agent to enhance MRI or magnetic resonance angiography (MRA) scans. Any hypervascular liver metastases can appear similar on MRIs. 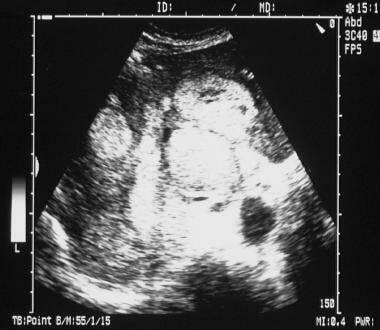 Ultrasonography shows evidence of biliary tree dilatation associated with an intraluminal hypoechoic or hyperechoic mass. A persistent fluid-filled, distended appendix without typical signs of appendicitis has been reported with a carcinoid of the appendix. Ultrasonographic and CT scan appearances are indistinguishable from those of islet cell tumors, but calcification is a clue to the diagnosis. Ultrasonographic findings usually demonstrate a hypoechoic mass, which may be of varying size but tends to be small. Ultrasonography may demonstrate lymph node and liver metastases. Perirectal infiltration is better demonstrated on endorectal ultrasonography and endorectal MRI. Ultrasonography of the bowel can depict bowel tumors, with a pseudokidney sign. Associated lymphadenopathy and liver metastases may be demonstrated on ultrasonograms. On ultrasonograms, carcinoid findings are too nonspecific to offer a confident diagnosis. Any bowel mass or hypervascular liver metastases can result in similar findings. Scintigraphy performed with a somatostatin receptor analogue may prove useful in the treatment of patients with hypergastrinemic states who have increased incidence of gastric carcinoids. In patients with multiple endocrine neoplasia type 1 (MEN-1), localization in the upper abdomen may not be associated with a pancreatic endocrine tumor but rather with a gastric carcinoid. Somatostatin-analogue scintigraphy has been proven sensitive. However, the findings are nonspecific, because the study may also show positive findings for islet cell tumors. Characteristic appearance of small bowel carcinoid in a 55-year-old man presenting with clinical features of bowel obstruction. 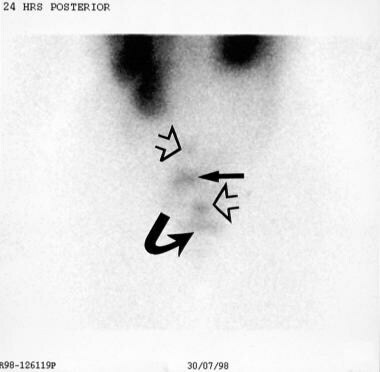 Images from an indium-111 octreotide scintigraphic study (at 44 h) show the primary lesion (straight arrow, top left image), mesenteric metastases (curved open arrow, top left image), liver metastases (arrows, top right image), and a rib metastatic deposit (arrow, bottom right image); this was confirmed on postmortem study. 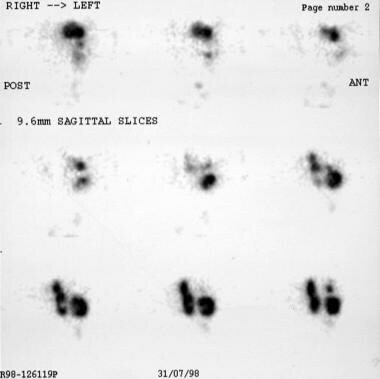 Bladder activity, which is a normal phenomenon, is marked by a curved solid arrow (top left image). 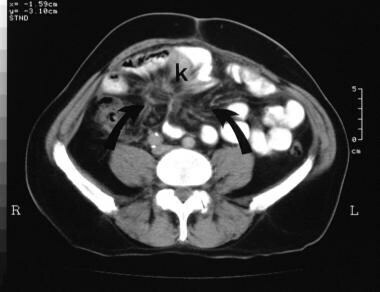 Characteristic appearance of small bowel carcinoid in a 55-year-old man presenting with clinical features of bowel obstruction. Images from an indium-111 octreotide scintigraphic study (at 68 h) show the primary lesion (straight arrow, top left image), mesenteric metastases (curved, open arrow; top left image), liver metastases (arrows, top right image), and a rib metastatic deposit (arrowhead, bottom right image); this was confirmed on postmortem study. Bladder activity, which is a normal phenomenon, is marked by a curved, solid arrow (top left image). Scintigraphy performed with iodine-123 (123 I) meta-iodobenzylguanidine demonstrates a 44-63% uptake in gastrointestinal carcinoids. A higher frequency of radionuclide uptake is found in midgut carcinoids and tumors with elevated serotonin levels. See the additional images below. 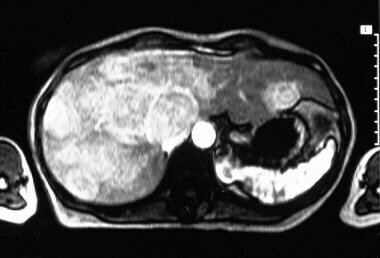 Characteristic appearance of carcinoid liver metastases. Planar indium-111 octreotide scan shows the primary lesion (solid straight arrow), mesenteric metastases (open straight arrows), and multiple liver metastases. Bladder activity is indicated by a curved arrow. Characteristic appearance of carcinoid liver metastases. Planar indium-111 octreotide scan shows the primary lesion, mesenteric metastases, and multiple liver metastases. Bladder activity is indicated by a curved arrow (see also the previous image). Characteristic appearance of carcinoid liver metastases. 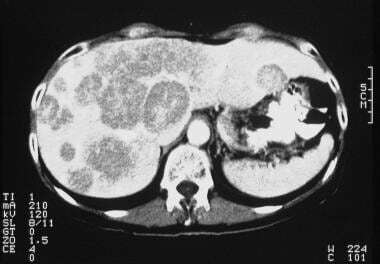 Single-photon emission CT scan obtained with indium-111 octreotide shows liver lesions in detail. Characteristic appearance of carcinoid liver metastases. 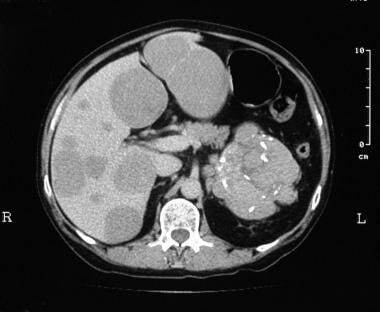 Single-photon emission CT scan obtained with indium-111 octreotide shows the liver lesions in detail (see also the previous image). 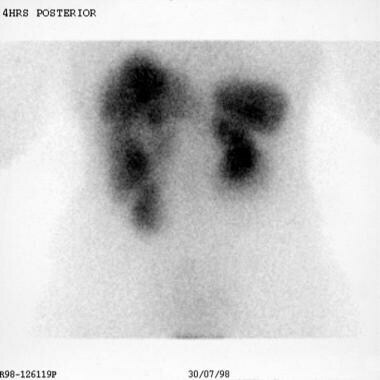 More than 90% of gastrointestinal carcinoids and their metastases are identified using somatostatin receptor scintigraphy, and accumulation is often seen in clinically unsuspected sites not recognized using other imaging techniques.18 F-dopa–PET scanning is a promising procedure that is a useful supplement to morphologic imaging methods. FDG-PET imaging is useful in poorly differentiated carcinoids when the results of somatostatin-receptor scintigraphy are negative. In addition, the possibility of uptake in areas of lymphocyte concentration in inflammatory states must be kept in mind. Characteristic appearance of carcinoid liver metastases. Celiac-axis angiogram shows early enhancement of the liver metastases in the arterial phase (see the next image for the capillary phase). 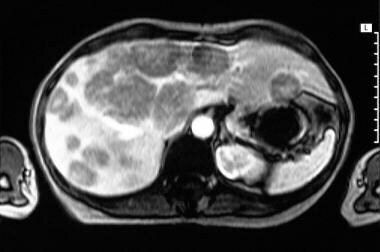 Characteristic appearance of carcinoid liver metastases. 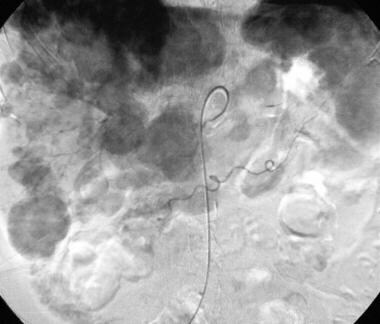 Celiac-axis angiogram shows persisting enhancement of the liver metastases in the capillary phase (see the previous image for the arterial phase). Appearance of pancreatic carcinoid. Left hepatic angiogram late capillary/early venous phase shows a large, left-lobe tumor with arteriovenous shunting (curved arrow). The pancreatic tumor also derives its blood supply from the left hepatic arterial circulation (straight arrows) (same patient as in the previous image). Foreshortening of the bowel occurring with desmoplastic reaction makes mesenteric arteries tortuous and frequently narrowed, in addition to drawing the arteries into a stellate pattern. Involved areas appear hypervascular, but in reality, the number of arteries in the area does not increase; instead, arteries contract into a smaller area because of fibrosis. With a high index of clinical suspicion, the degree of confidence in diagnosing gastrointestinal carcinoid is high when these findings are seen in combination with the other imaging features described. Findings are nonspecific and have been reported with sclerosing peritonitis, desmoid tumors, and a carcinoma of the pancreas invading the mesentery. Vinik A, Feliberti E, Perry RR. Carcinoid Tumors. Endotext [Internet]. 2015. [Medline]. [Full Text]. Gibril F, Reynolds JC, Lubensky IA, et al. Ability of somatostatin receptor scintigraphy to identify patients with gastric carcinoids: a prospective study. J Nucl Med. 2000 Oct. 41(10):1646-56. [Medline]. Kimura T, Sakahara H, Higashi T, et al. [Imaging of somatostatin receptor using 111In-pentetreotide]. Kaku Igaku. 1996 Apr. 33(4):447-52. [Medline]. Kwekkeboom DJ, Lamberts SW, Habbema JD, et al. Cost-effectiveness analysis of somatostatin receptor scintigraphy. J Nucl Med. 1996 Jun. 37(6):886-92. [Medline]. [Full Text]. Wang D, Zhang GB, Yan L, Wei XE, Zhang YZ, Li WB. CT and enhanced CT in diagnosis of gastrointestinal neuroendocrine carcinomas. Abdom Imaging. 2012 Feb 5. [Medline]. Varas-Lorenzo MJ, Gornals JB, Muñoz F, Loras C, Cruz M, Espinós JC, et al. Gastric carcinoid tumors: an analysis of 24 cases. Rev Esp Enferm Dig. 2013 Nov-Dec. 105(10):636-7. [Medline]. Orjollet-Lecoanet C, Menard Y, Martins A, et al. [CT enteroclysis for detection of small bowel tumors]. J Radiol. 2000 Jun. 81(6):618-27. [Medline]. [Full Text]. Ganeshan D, Bhosale P, Yang T, Kundra V. Imaging features of carcinoid tumors of the gastrointestinal tract. AJR Am J Roentgenol. 2013 Oct. 201(4):773-86. [Medline]. Fruauff A, Irwin GA, Williams HC, et al. CT demonstration of gastric carcinoid. AJR Am J Roentgenol. 1987 Jun. 148(6):1276-7. [Medline]. Tsai TL, Changchien CS, Hu TH, et al. Demonstration of gastric submucosal lesions by high-resolution transabdominal sonography. J Clin Ultrasound. 2000 Mar. 28(3):125-32. [Medline]. Adolph JM, Kimmig BN, Georgi P, et al. Carcinoid tumors: CT and I-131 meta-iodo-benzylguanidine scintigraphy. Radiology. 1987 Jul. 164(1):199-203. [Medline]. [Full Text]. Hoegerle S, Altehoefer C, Ghanem N. Whole-body 18F dopa PET for detection of gastrointestinal carcinoid tumors. Radiology. 2001 Aug. 220(2):373-80. [Medline]. [Full Text]. Koopmans KP, Neels OC, Kema IP, et al. Improved staging of patients with carcinoid and islet cell tumors with 18F-dihydroxy-phenyl-alanine and 11C-5-hydroxy-tryptophan positron emission tomography. J Clin Oncol. 2008 Mar 20. 26(9):1489-95. [Medline]. Adams S, Baum R, Rink T. Limited value of fluorine-18 fluorodeoxyglucose positron emission tomography for the imaging of neuroendocrine tumours. Eur J Nucl Med. 1998 Jan. 25(1):79-83. [Medline]. Bousen E, Reuter SR. Mesenteric angiography in the evaluation of inflammatory and neoplastic disease of the intestine. Radiology. 1966 Dec. 87(6):1028-36. [Medline]. Sharma KV, Gould JE, Harbour JW, et al. 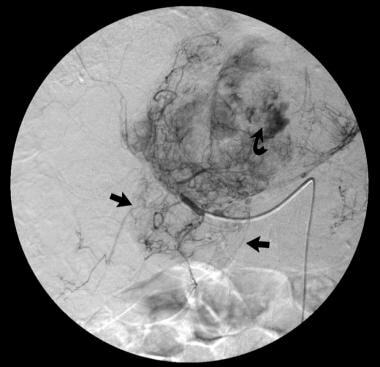 Hepatic arterial chemoembolization for management of metastatic melanoma. AJR Am J Roentgenol. 2008 Jan. 190(1):99-104. [Medline]. Single-contrast-phase image of a barium enema study shows an eccentric narrowing of the splenic flexure associated with paucity of gas in the right hypochondrium resulting from a probable soft-tissue mass. Characteristic angiographic appearance of a carcinoid mesenteric invasion. 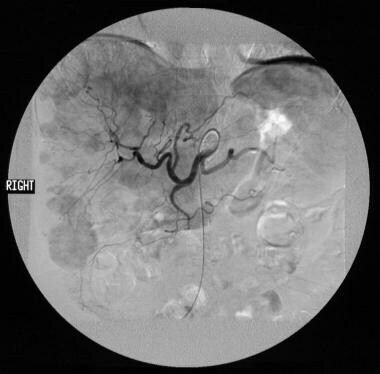 Arterial/early capillary phase of a superior mesenteric angiogram (same patient as in the previous image) shows the typical radiating configuration of the branches with tortuous peripheral vessels (curved arrows) in the region of the splenic flexure mass. Note the edge of the mesenteric mass (arrowheads) and arterial encasement (straight arrow). Uptake of iodine-131-meta-iodobenzylguanidine (I-131 MIBG) was more likely if neurohumor levels, particularly serum serotonin, were elevated. There was no relationship of I-131 MIBG uptake to carcinoid syndrome. Courtesy of Dr Ghulam Mustafa Shah Syed.